Ever wonder what an acupuncture needle is made of? For many people who have never had acupuncture, it is the thought of many needles being put into the body that is unappealing. As someone who strongly dislikes having blood taken or having freezing at the dentist because of the needles involved, I can completely empathize. But, I am here to tell you in all honesty, that an acupuncture needle is nothing to fear. They are tiny, and most often, painless. 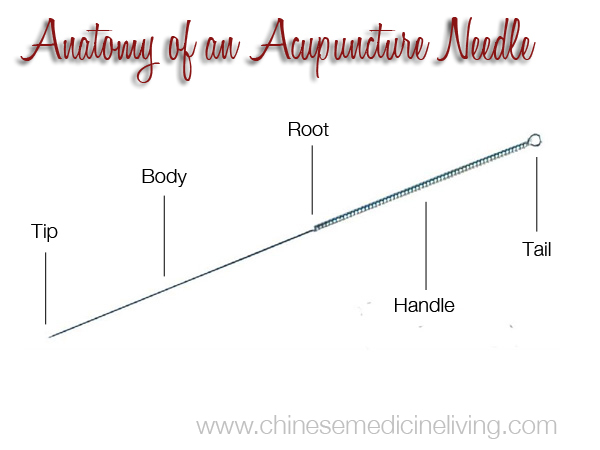 In ancient China, acupuncture needles were first made of simple materials like stone or animal bone. While the needles below may not have been used painlessly, their discovery between 10,000 and 4000 years ago shows how long acupuncture has been in existence, and how many years have been behind its use and development. Today, acupuncture needles are made of modern materials, like stainless steel. 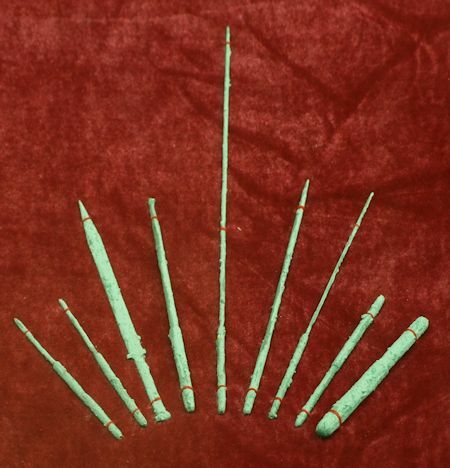 The ancient Chinese used needles made out of metals like iron, steel, gold and silver, and each was seen to have different effects on the conduction of Qi and were used for treating different conditions. Gold needles, for example, were used if there was weakness in the body and tonification was needed. Silver was thought to be the best choice when treating fevers, pain and inflammation for its strongly dispersing qualities. You can still buy gold and silver acupuncture needles, but as they are so expensive, most acupuncturists choose needles made of stainless steel. 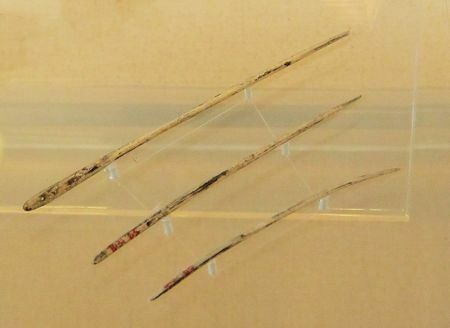 In ancient China, needles were cleaned and reused, but now due to safety, most needles are one time use and disposable. Modern acupuncture needles typically have 5 different parts. They are listed in the chart below. Acupuncture needles come in many different gauges (thicknesses) and lengths. Usually, the finer the gauge, the less the patient will feel the needles. But, the finer the needles, the more flexible they are as well, so the acupuncturist using them must have excellent skills to get them into the body without bending them. The thicker the needles, generally, the stronger the stimulation. Most acupuncturists have their preferences for the gauge they like to use, and many have several gauges depending on the patient and the presenting condition. For example, if a patient is thin and has anxiety about needles, a smaller gauge needle is probably advisable. However, someone with a very Yang constitution, large body, loud, booming voice and high energy would probably benefit from a thicker gauge needle and slightly more stimulation. The length of the needles varies widely as well. The shortest needles tend to be used for areas of the body with thin skin without much muscle or fat underneath like the face (for cosmetic acupuncture), hands and feet, and longer needles are used for areas of the body with more mass like the legs, abdomen and back. Most acupuncturists keep several length’s of needles around for all the different types of bodies they treat. 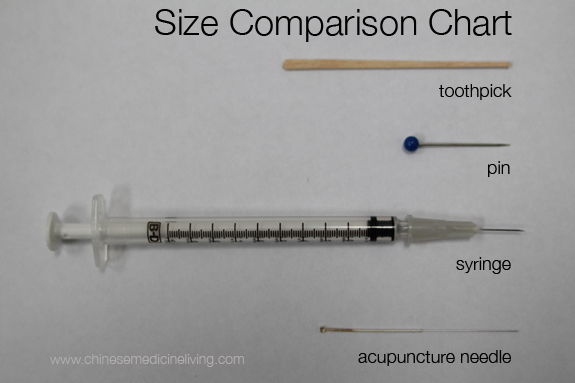 Below is a chart to help you understand the size relationship between an acupuncture needle and some other common objects. Acupuncture needles are very thin, only slightly thicker than a human hair. The come in different thicknesses and lengths, but are much finer than a hypodermic needle used to give shots or take blood. The Chinese posit that there are more than two thousand acupuncture points on the human body. Acupuncturists spend years in school learning anatomy and physiology so that they know the exact location of each of the acupuncture points. When a needle is inserted into the body, the angle and depth of insertion are extremely important. The depth is important because of the anatomical structures underneath it, but there is also a correlation between the type of condition being treated and the depth of insertion. Below is a list of things treated by both shallow and deep insertion. As you can see, acupuncture needles have come a long way. Like anything, acupuncture needles vary in cost and quality and most practitioners have the brands they like to use. With modern technology manufacturing has evolved and acupuncture needles can now be produced with relative ease. There are still parts of the world that reuse needles with things like autoclaves, but in most places in Europe and North America, by law, acupuncture needles are sterile, one use and disposable. And if you have ever had acupuncture you will know how amazing it is that a few little needles can have such a profound effect on the body, mind and spirit.